Ningbo ETDZ Holdings Ltd. owns foam factory and sewing factory to produce gymnastics mats, cheerleading mats, dancing mats, martial arts mats and equipments under ISO9001, ISO14001 and OHSAS18001. 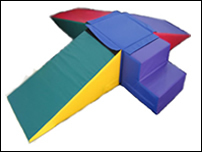 Folding tumbling mats, Landing mats and Competition Landing mats, Skill Cushion Practice mats and Mushy mats, Vault block and Spoting Block, Balance beam and others. Back Handspring machine, Octagon, Incline and others. Folding panel mats and others. Donut Rocker, Mailbox, Steps, Cartwheel beam mats, Block Buster, Molly ball barrel, Tumble drum, Fun center, Jump horse, Dynamat, Varioplinth, Varioblock, Tower, Variorond, Variotunnel,Varioplan, Catch Climbing, Toboggan, ladder, Maxiluna, Circusroll, Pipe, combo and others. All equipments can be used for training, exercise, physical education at school, club, home and competition. All equipments have fine quality and safe according to FIG Standard. We use high quality material to make our products, and our sawing staffs have rich experience. We develop many new items as well as to meet gymnastics and cheerleading development. Now we become best manufacturer in china. Warmly welcome your sincere inquirise and contact, we will offer high quality, good service and competitive price to you.